The Results for Marriage (Kalyana) Porutham between Bharani Girl and Chittirai (Kanni Rasi) Boy: 6 out of 10. (Results: 6 out of 10 is enough for a Marriage). 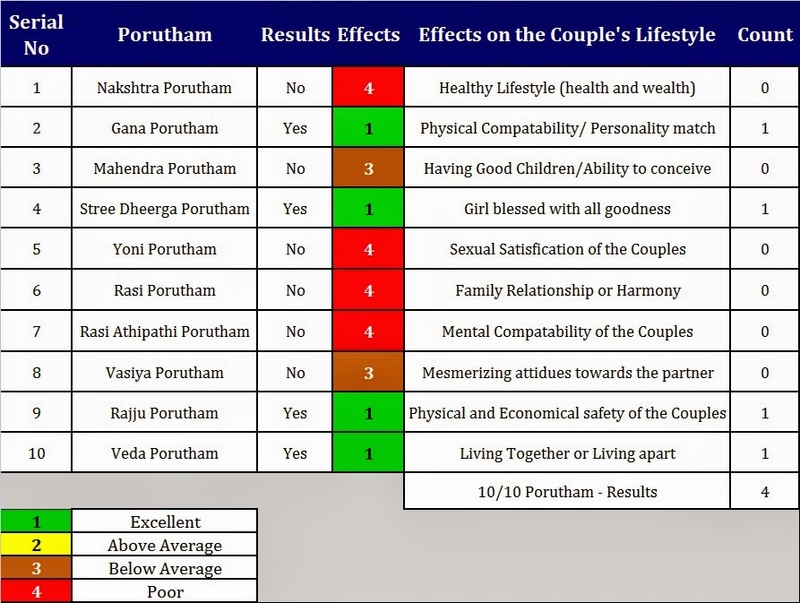 The Results for Marriage (Kalyana) Porutham between Bharani Girl and Hastham (Kanni Rasi) Boy: 4 out of 10. (Results: 6 out of 10 is enough for a Marriage). 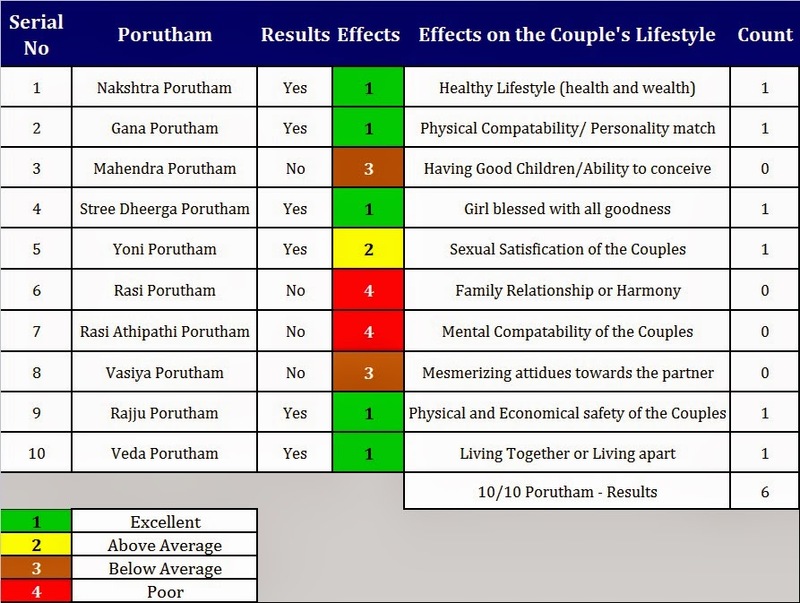 The Results for Marriage (Kalyana) Porutham between Bharani Girl and Uthiram (Kanni Rasi) Boy: 6 out of 10. (Results: 6 out of 10 is enough for a Marriage). The Results for Marriage (Kalyana) Porutham between Aswini Girl and Chittirai (Kanni Rasi) Boy: 3 out of 10. (Results: 6 out of 10 is enough for a Marriage). The Results for Marriage (Kalyana) Porutham between Aswini Girl and Hastham (Kanni Rasi) Boy: 6 out of 10. (Results: 6 out of 10 is enough for a Marriage). But note that the important Yoni, Rasi and Rasi Athipathi Porutham is not available. Note: For the kalyana (marriage) porutham for Aswini boys, please see it under the appropriate Girl's birth nakshatra. The Results for Marriage (Kalyana) Porutham between Aswini Girl and Uthiram (Kanni Rasi) Boy: 4 out of 10. (Results: 6 out of 10 is enough for a Marriage). But note that the important Yoni, Nakshatra, Rasi and Rasi Athipathi Porutham is not available. "STREE DHEERGHA PORUTHAM (SUMAGALI PORUTHAM) FOR CHITTIRAI GIRLS"
We have studied various aspects of Stree Dheergha Porutham. Now let us see the "Stree Dheergha Porutham" for the Chittirai Girls. 1. The Girls who has the Chittirai as their Birth Star. 2. The Boys who choose their wife or the girl to be married with Chittirai as their Birth star. 1. Best Match: Revathi, Aswini, Bharani, Kiruthigai, Rohini, Mirugasirisa, Thiruvathira, Punarpusam, Pusam, Ayilyam, Magham, Pooram, Uthiram and Hastham. 2. Average Match: Pooradam, Uthiradam, Thiruvonam, Avittam, Sathayam, Purattathi and Uthirattathi. 3. Worst Match: Swathi, Visakam, Anusham, Kettai and Moolam. "STREE DHEERGHA PORUTHAM (SUMAGALI PORUTHAM) FOR HASTHAM GIRLS"
We have studied various aspects of Stree Dheergha Porutham. Now let us see the "Stree Dheergha Porutham" for the Hastham Girls. 1. The Girls who has the Hastham as their Birth Star. 2. The Boys who choose their wife or the girl to be married with Hastham as their Birth star. 1. Best Match: Uthirattathi, Revathi, Aswini, Bharani, Kiruthigai, Rohini, Mirugasirisa, Thiruvathira, Punarpusam, Pusam, Ayilyam, Magham, Pooram and Uthiram. 2. Average Match: Moolam, Pooradam, Uthiradam, Thiruvonam, Avittam, Sathayam and Purattathi. 3. Worst Match: Chittirai, Swathi, Visakam, Anusham and Kettai. 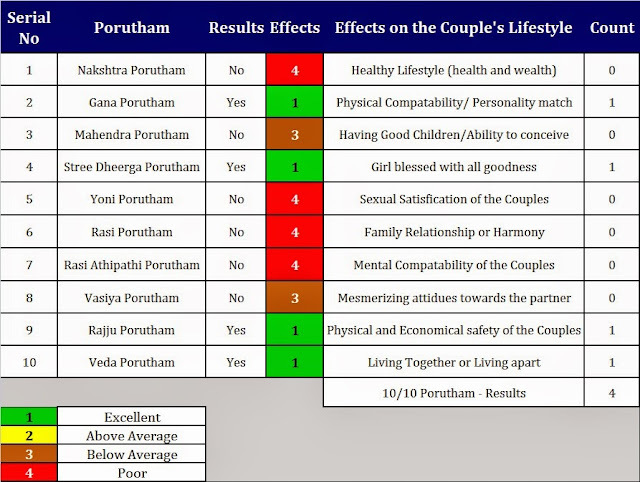 "STREE DHEERGHA PORUTHAM (SUMAGALI PORUTHAM) FOR UTHIRAM GIRLS"
We have studied various aspects of Stree Dheergha Porutham. Now let us see the "Stree Dheergha Porutham" for the Uthiram Girls. 1. The Girls who has the Uthiram as their Birth Star. 2. The Boys who choose their wife or the girl to be married with Uthiram as their Birth star. 1. Best Match: Purattathi, Uthirattathi, Revathi, Aswini, Bharani, Kiruthigai, Rohini, Mirugasirisa, Thiruvathira, Punarpusam, Pusam, Ayilyam, Magham and Pooram. 2. 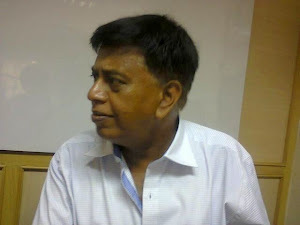 Average Match: Kettai, Moolam, Pooradam, Uthiradam, Thiruvonam, Avittam and Sathayam. 3. Worst Match: Hastham, Chittirai, Swathi, Visakam and Anusham. The Kanni rasi is another zodiac sign that is owned by the Budha. The Kanni rasi (Virgo sign) people rely heavily on their skills and knowledge. These Kanni rasi (Virgo sign) people studies throughout their life time. The Kanni rasi (Virgo sign) people easily study the behavorial pattern of other peoples. Thus they easily adjust with the situation and they never compromise on their honor. These qualities makes the Kanni rasi (Virgo sign) people to get along with everyone. In particular the Kanni rasi (Virgo sign) people would be either submissive or cooperative with the Mithuna rasi and Viruchika rasi. 1. The male and females of the Kanni Rasi would be submissive to the male and females of the Viruchika rasi and Mithuna rasi. But the opposite is not true. 2. The male and females of the Viruchika rasi and Mithuna rasi may not be submissive to the male and females of the Kanni rasi. Also the Rishaba rasi and Meena rasi would be either submissive or cooperative with the Kanni rasi. 3. The male and females of the Rishaba rasi and Meena rasi would be submissive to the male and females of the Kanni rasi. 4. The male and females of the Kanni Rasi may not be submissive to the male and females of the Rishaba rasi and Meena rasi. Thus the Vasiya Porutham are for the Kanni rasi is applicable with Rishaba rasi, Mithuna rasi, Viruchika rasi and Meena rasi. But there are differences on these Vasiya Porutham. Readers are advised to study this Vasiya Porutham carefully.